Spring seems to be in the air, flowers are starting to bloom, and the trees are budding. Over the next month we should see lots of changes in nature as spring really gets underway. By visiting Eagle Creek Park often you won’t miss any of the amazing changes that nature offers this time of year. 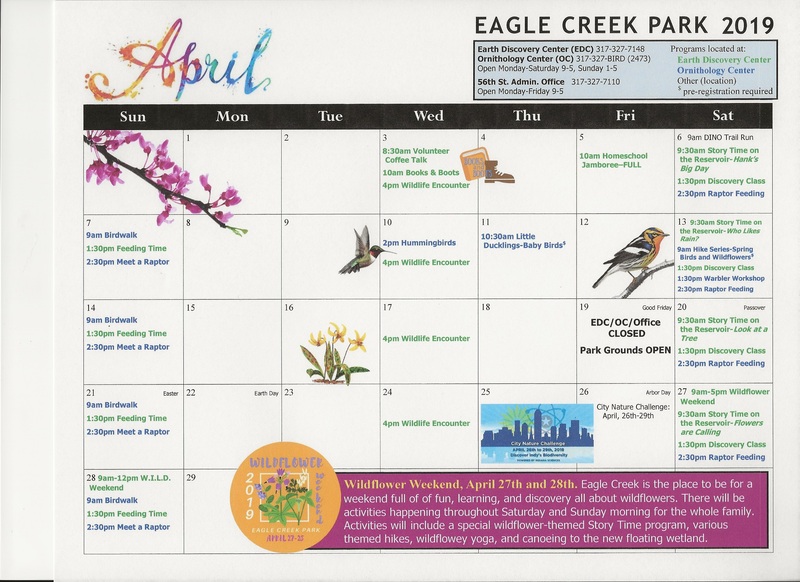 Attached is the April calendar for Eagle Creek Park. Check it out for programs and other information. Wildflower Weekend (April 27th and 28th) is the same weekend as the Indianapolis City Nature Challenge. 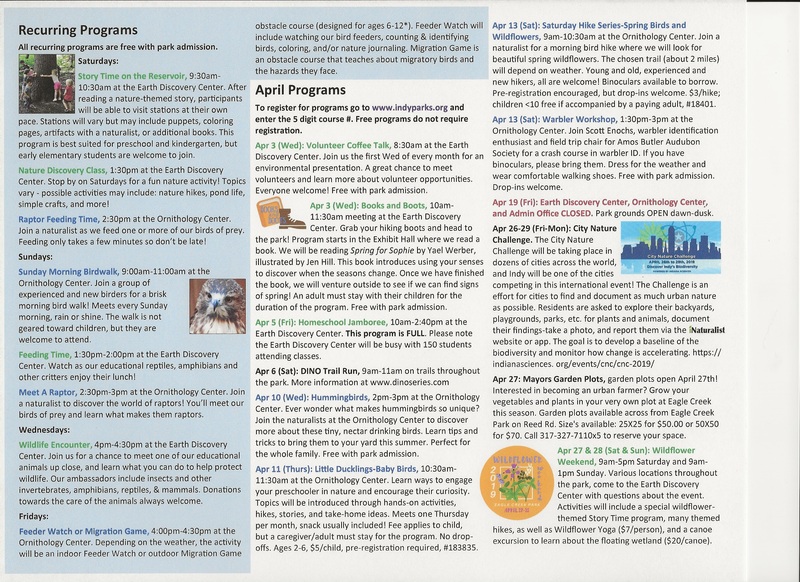 A lot is going on at Eagle Creek Park that weekend. If you are not able to attend the event at the park, you still can participate in the nature challenge by downloading the free i-Naturalist app. Look for more information under April Programs. The Mayor’s Garden Plots open April 27th. Details on the size of the plots and the rental charge is also under April Programs. Want to remind everyone that this coming Saturday, April 6th, will be our annual “Great Indy Cleanup” from the causeway west to Raceway Road. We will be starting at 9 a.m. by meeting at the Eagle Creek Park Office, 7840 W. 56th Street. We will be working until noon. I hope that many of you can join us. If you cannot stay the entire 3 hours, any time that you are able to help would be greatly appreciated and make a difference. By working together we can make this area look so much better! See attached flyer for more information. I want to thank everyone who does cleanup on a regular basis areas along the roads, greenways, and in the parks. I have noticed a lot of you out lately “Spring Cleaning” some of these areas. It is greatly appreciated. Now if we could only get people to quit throwing out trash in the first place! 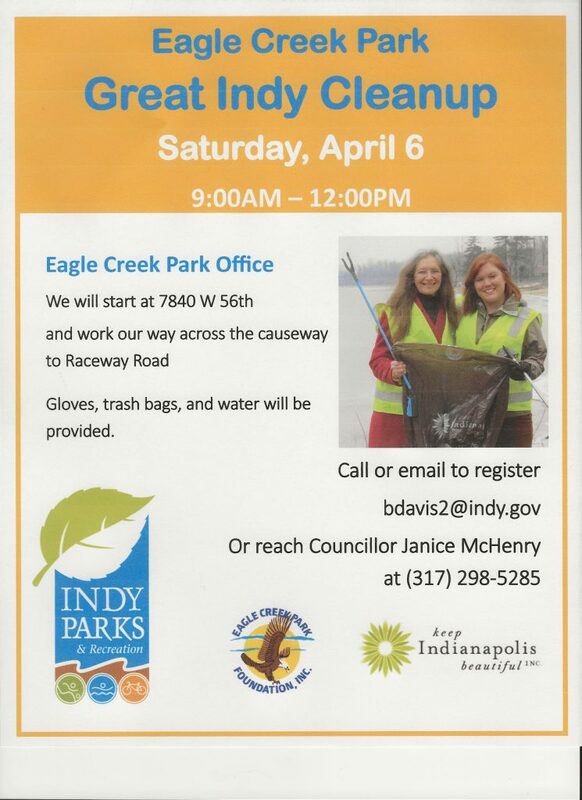 Please feel free to forward this information on to others who may be interested in what is going on at Eagle Creek Park or coming out to volunteer with our clean up on Saturday. Your help in spreading the word is appreciated.